We all know that John Lackey’s 1-0 sinker down and in to Justin Turner last night was deposited by the Dodgers third baseman into the outfield seats, resulting in a walk-off win for the home team in Game 2 of National League Championship Series. It’s possible, however, that the Cubs actually lost the game a moment before that — not when Turner’s fly ball cleared the outfield fence, but when Lackey and catcher Willson Contreras agreed on that particular pitch. Because, as good as Justin Turner was in 2016, he was better in 2017 and all the improvements he made in between helped prepare him for Lackey’s 1-0 offering. Trying to decipher the source of Turner’s superior 2017 campaign isn’t easy. He hit more fly balls this year, yes. Looking through the swing charts, though, it’s not easy to pinpoint one cause for that development. His overall swing and reach rates were down a little, perhaps, but mostly consistent with his career rates. 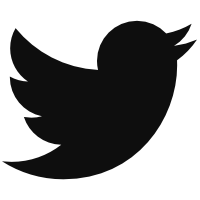 Two things might jump off the page. First: Turner got better at fastballs. His production versus four-seamers and sinkers, by pitch-type values, improved more than against any other offering. Turner also avoided the strikeout more often. 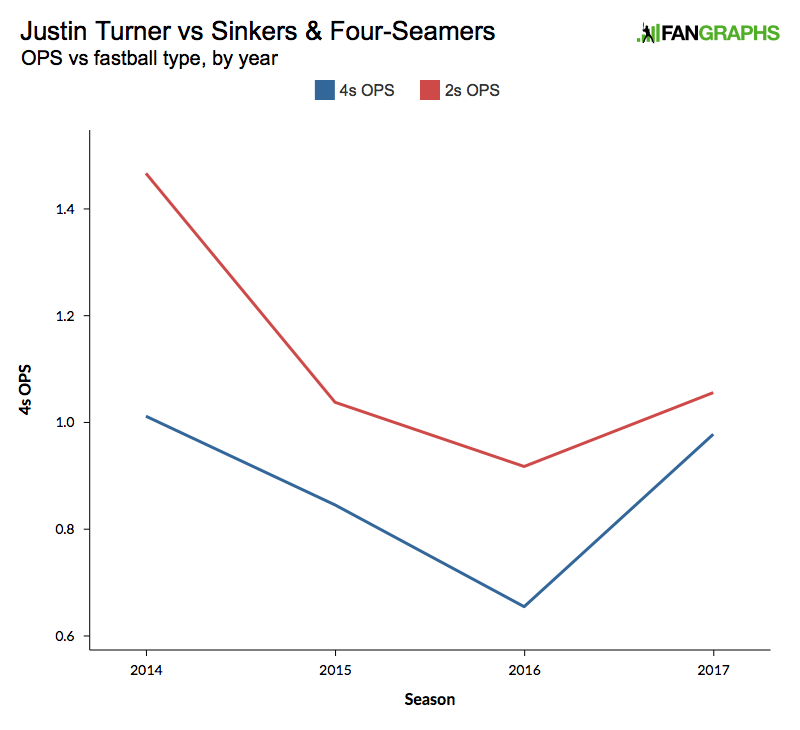 To record a lower strikeout rate while producing swing and contact rates roughly commensurate with his career averages, it’s likely that Turner somehow altered his sequencing — that is, the order in which he swung at pitches. Let’s look at 1-0 counts, since that was the situation in which Turner hit his homer last night. In 2016, Turner swung at 39.6% of the pitches he faced in those counts. This past season, Turner swung at 40.6% of 1-0 offering. There seems to be little difference there, until you look at which 1-0 pitches he swung. Turner saw fewer four-seamers in 1-0 counts this year, so he’s adapted. He’s now attacking sinkers in 1-0 counts with greater frequency, even if it means he’s a bit more vulnerable to changeups down and in. Don’t see all of that here? Look at his swing rates on changeups last year and this year, and you do see a few more swings at changeups down and in. But for that possible added weakness — against a pitch that’s rarely thrown, the inside changeup — Turner has turned up the volume on his work against sinkers. 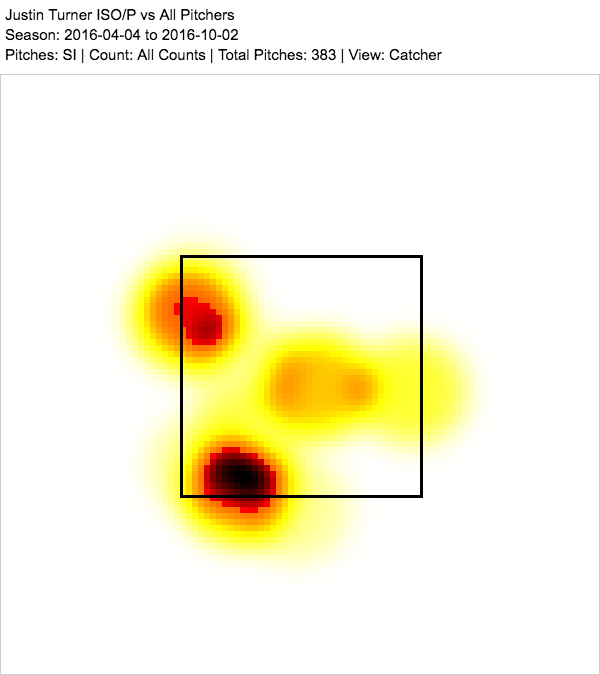 Look at his isolated-slugging heat map on sinkers in 2016 first. See that red spot located middle-in in the latter of those charts? Well, that location should look familiar. But maybe Turner’s “go get the ball” approach has helped him hit sinkers in general. He’s a strong producer against the pitch, top 15 this year, and has been better at two-seamers his whole career. But last year, Turner was 113th against the sinker by pitch-type values. His production on the pitch took a small hit. 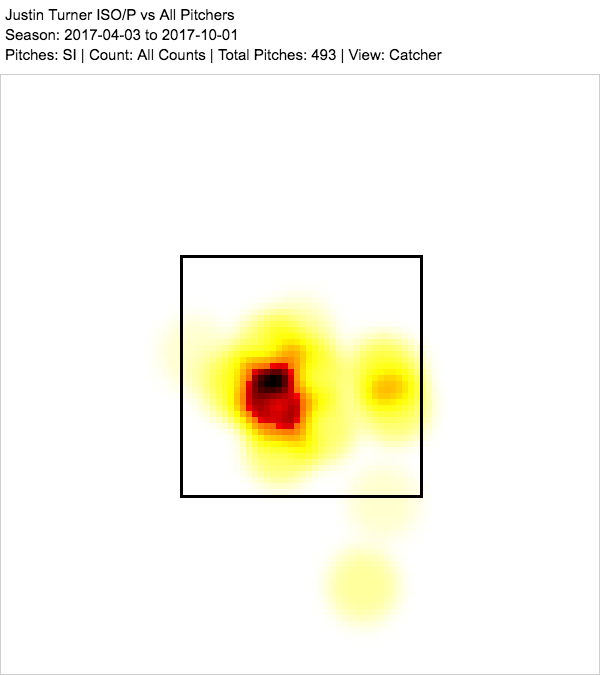 It looks like, instead of shrinking from the challenge that the sinker was offering, Turner decided to go get it, particularly in 1-0 counts, where the location of the pitch might be to his advantage. Being aggressive turned Justin Turner’s career around the first time. Being aggressive against sinkers in 1-0 counts might have been a big part of his resurgence this year. He had a 1.428 OPS against those pitches, anyway. Oh, and one sweet walk-off three-run homer in the playoffs that might have been a long time coming. We hoped you liked reading About That Pitch to Justin Turner by Eno Sarris!